Another character I thought of right away when I thought about movie - in this case tv - characters that used baseball bats Negan with his trusty "Lucille" from The Walking Dead. Personally I'm just lukewarm on The Walking Dead. It seems to draw me in with an exciting episode and then there'll be 2 to 3 episodes in a row where it's a bit of a snooze fest. I really liked the Negan character when he was introduced. I think Jeffrey Dean Morgan is super charismatic. But, after a while the he seemed to be doing a parody of the character with all his various mannerisms. And that's my little Walking Dead rant. The Walking Dead of course is a modern show. So for the card I was just chose what design I thought would be the funnest to use. I chose the 1984 Topps baseball inspired design. I like all the Topps designs that call for a main photo and then the smaller head shot, no pun intended. The '84 takes a little more time with having to crop out the head picture but the end result is always a great vintage look. I also wanted a design that would prominently feature the team name so I could have fun with "Saviors" as the team name. I also wanted a design that featured a player position on the front of the card so I could add the "DH" designation for the same dark humor reason as with the Al Capone card in the last post. I'm pretty sure this is the only Walking Dead card I'm going to do. I just thought it would be fun to make a Negan baseball card. I'm not really wanting to make a Walking Dead set, those already exist. Plus, the show has been running for so many years and features a lot of different characters and I wouldn't be able to trust myself to keep the number of cards under control. 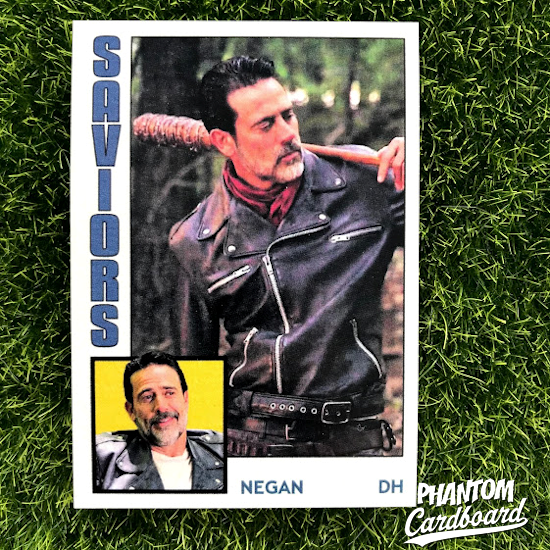 Not a Negan fan - I think the character is noxious and the story arc has killed the show, but this is a beautifully crafted card. The Designated Hitter role is just a hoot! Yea, I chuckled about the DH part myself. I was hoping others might find it humorous even if only on a Dad-joke level. How many of these are made and what's a good price on them?